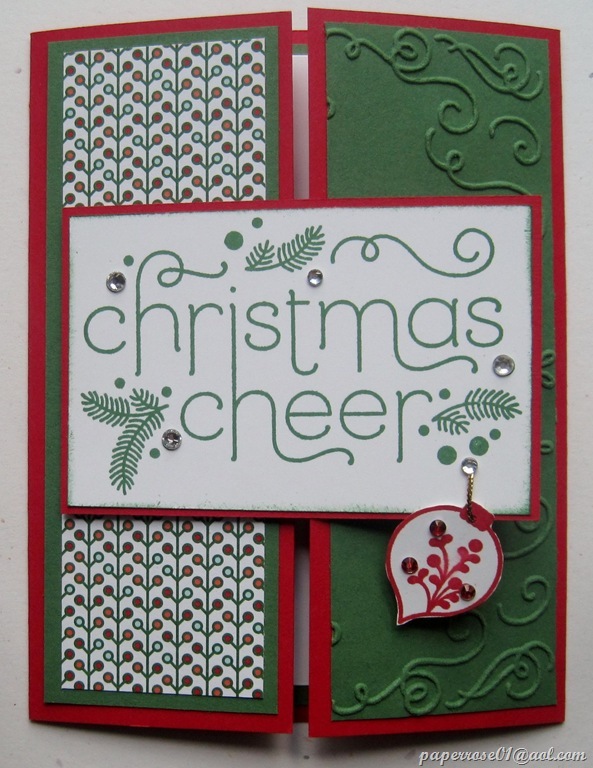 Christmas Cheer is our first card stamped with the “Christmas Cheer” set. 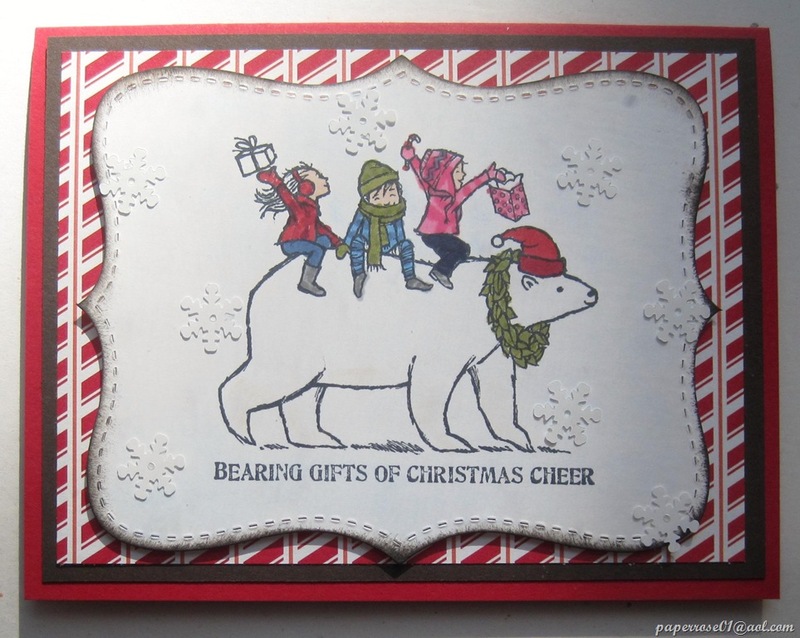 This gatefold card is done in Real Red, Whisper White and Garden Green, and uses Nordic Noel DSP. Deb cleverly designed this card using the new Filigree Frame embossing folder only on 1 side of the gate. One of the 4 ornament images is stamped, trimmed by hand, and attached to the main image with gold cording. Finally, a few rhinestones are adhered to add a touch of bling. 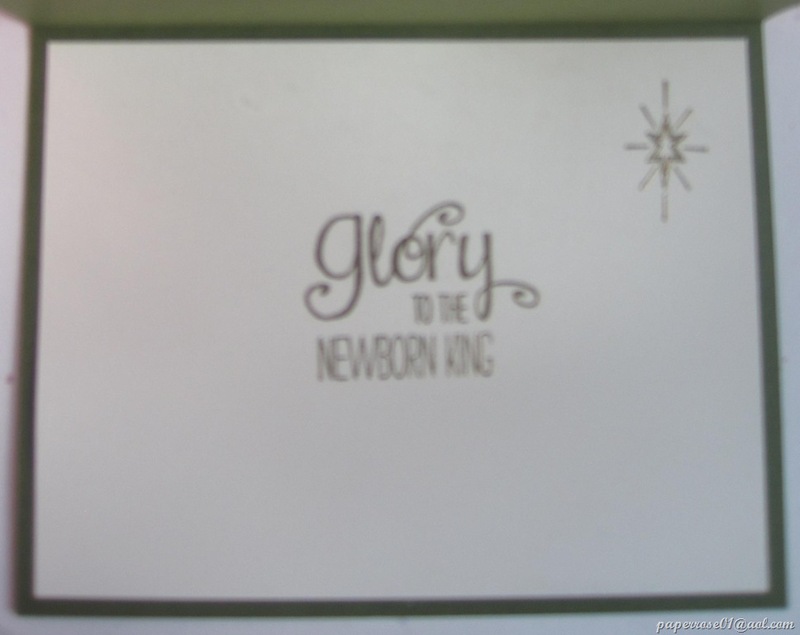 The second card comes from “The Newborn King” stamp set. 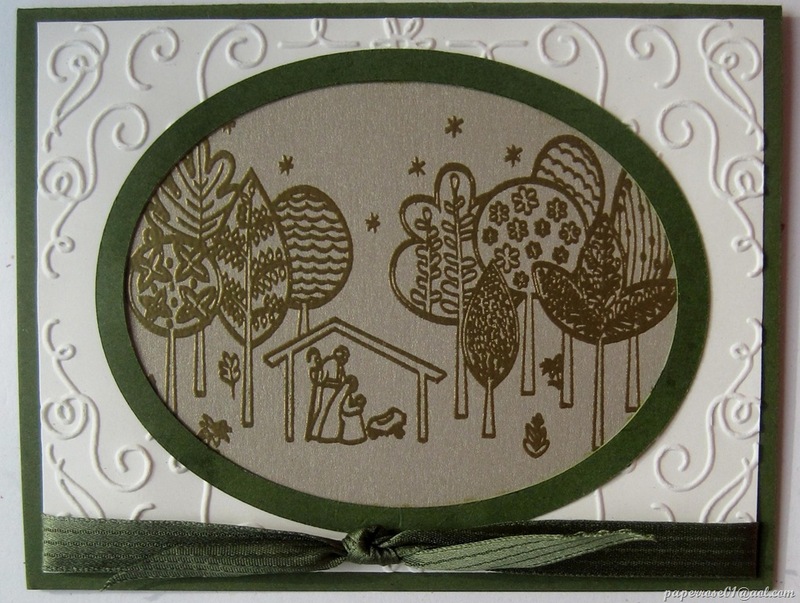 This elegant card is done in Mossy Meadow, gold, and Very Vanilla. The Filigree Frame embossing folder is used again, this time for the frame around the image. The image is embossed in gold on brushed gold card stock and framed with Mossy Meadow . A bit of Mossy Meadow stitched satin ribbon provides the finishing touch to this very elegant card. You may wish to consider gold-embossing the message and star that come in the set. I also embossed a single gold star on the envelope. The added gold embossing carries the elegance from the envelope thru the entire presentation. The “Visions of Santa” stamp set is one of my favorites this year and gives us a touch of humor. There are actually 5 options for this card. You can stamp the moose in his underwear as shown here, or or stamp 1, 2 or 3 of the 4 Santa images. Of course all of the Santas are in their underwear also! See the next picture for 3 of the Santas. This stamp set is done in Old Olive, Real Red, and Early Espresso. The moose and Santas are stamped on a white tag that is layered on an espresso tag, and colored with Blendabilities. 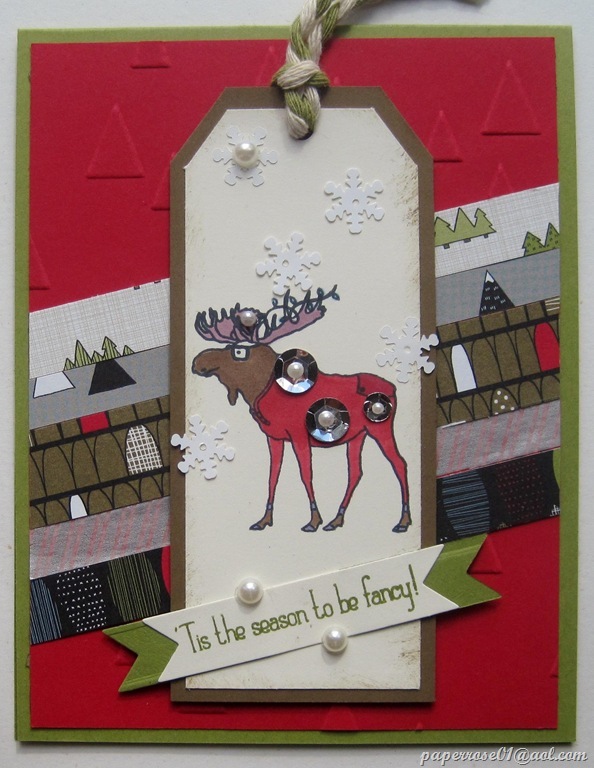 The moose, Santa images and tag are then embellished with silver sequins, white snowflakes, and pearls. Santa & Co. DSP is added in angled strips on the Real Red layer that is embossed with the new On Point embossing folder. Finally, the natural and Old Olive super chunky trim is pulled thru the hold in the tag. These cards are just too cute! The elegant and Christmassy “Wondrous Wreath” is done in Garden Green, Cherry Cobbler, and Very Vanilla. The embossed Stylish Stripes background sets off the cobbler and vanilla banners which pop up with Stampin’ Dimensionals. Several loops of slender gold ribbon are the perfect background for the stamped and die-cut wreath. 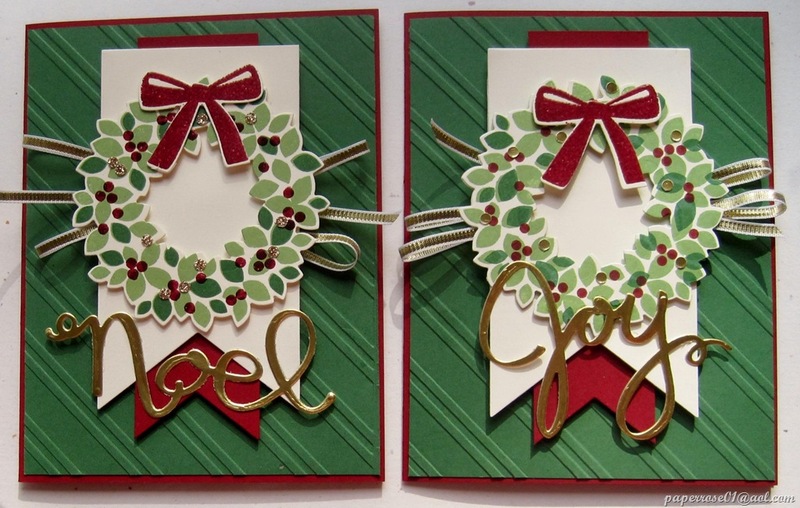 The “Joy” and “Noel” messages are easily die cut on gold foil card stock. Our fifth and final card for our 2014 Stamp-A-Stack is “Bright and Beautiful” which is sized to fit the stars framelits. This simple card is done in Soft Sky and Lost Lagoon with a panel of All is Calm DSP. 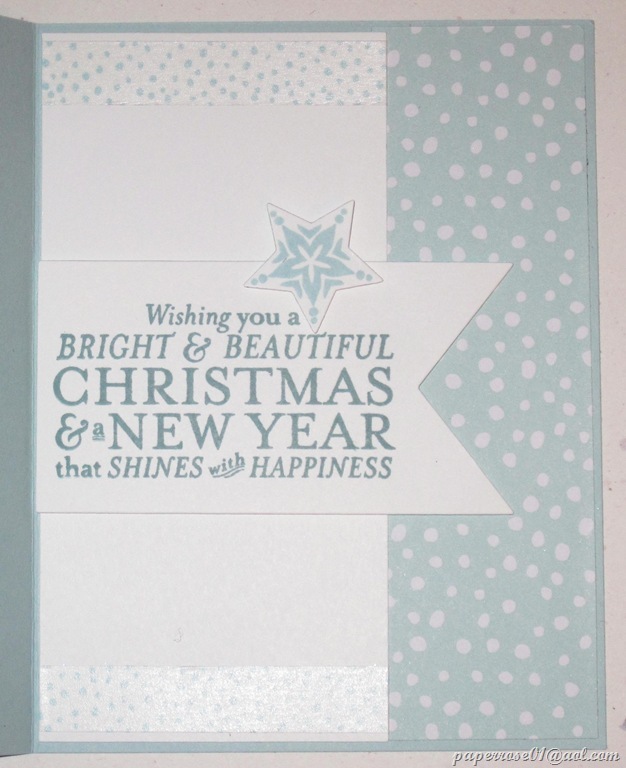 Two cards for each crafter will have the Soft Sky and White DSP and one card with the silver and white DSP shown below. The new Lucky Stars embossing folder adds dimension and texture to the Lost Lagoon. 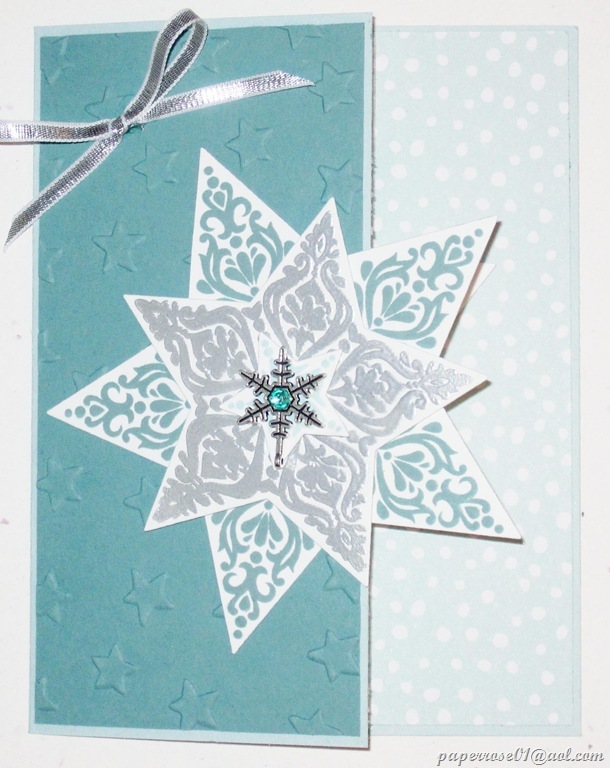 Three stars are stamped and die cut – one in Lost Lagoon, one wet-embossed in silver, and one in Soft Sky. The small Soft Sky star is embellished with a single All Is Calm snowflake embellished an d a blue rhinestone. 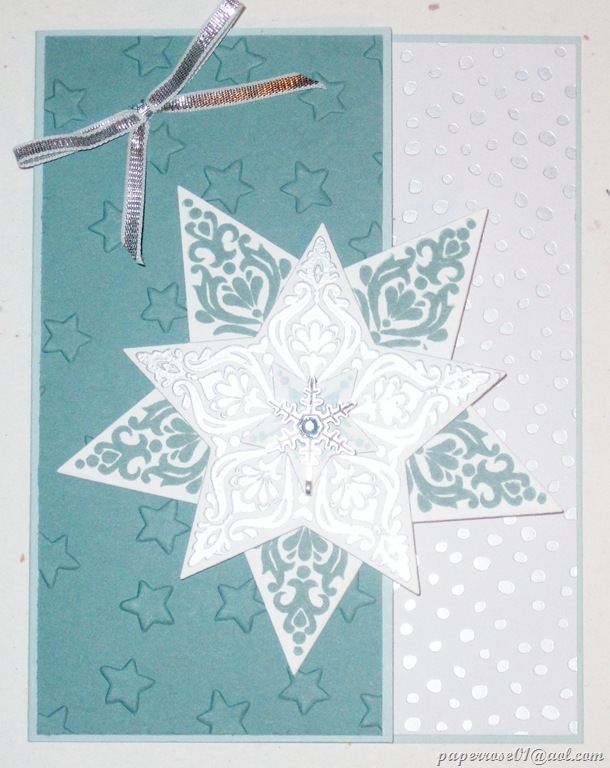 The stars are popped up with Stampin’ Dimensionals and a small silver ribbon decorates the upper corner. The card to the left is an example of the same card with the silver and white All is Calm DSP. The two samples indicate two different centers that could be used. Both include All is Calm Washi Tape. The center to the right shows a beautiful message that comes with the set. We have stamped it in Lost Lagoon on a die-cut banner and added a Soft Sky star. The banner must be placed carefully to keep it from interfering with the front view of the card. 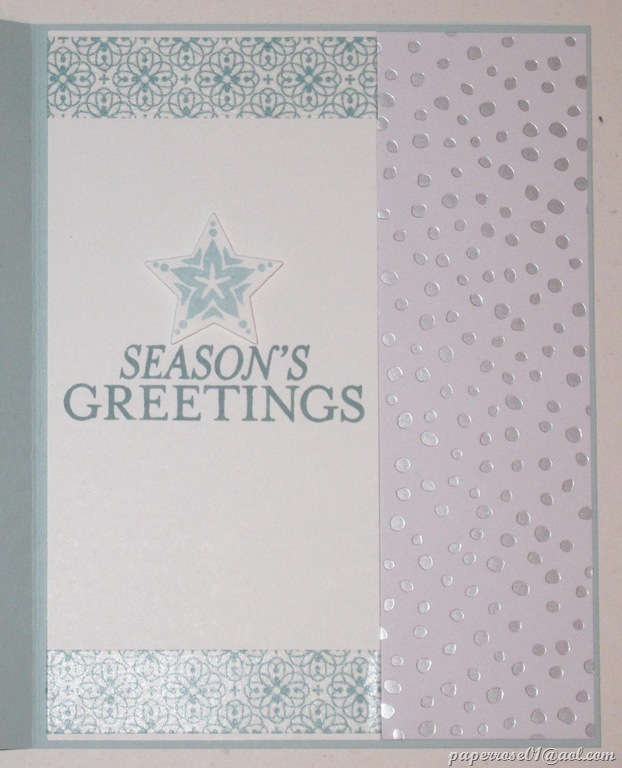 The other inside message for Bright and Beautiful includes the Season’s Greetings message from the set, and a die-cut star. Both centers are attractive and you can choose the ones that you prefer, or choose something totally different. Each sample gives ideas for the center of the card and the envelope. For those of you who are not attending the Christmas Stamp-A-Stack, I hope these samples give some ideas for your holiday card creations. Give me a call, or send an E-mail if you have any questions. December Stamp Camp will be lots of fun as we craft a holiday pop-up box, holiday tags, and have the opportunity to stamp the new Gentle Peace stamp set on vellum for a very special card. We will have all the accessories for the card ready to go so you can stamp your vellum, and if you prefer, take it home to color and put together. I know how busy the month of December, but this new stamp is so special, that I want you to be able to have the image. I love this card! The shimmer of glitter on the dryer sheet is just gorgeous!!!! The technique of using a dryer sheet is quite simple but can be a bit messy with all the glitter. The pine images were first stamped in Garden Green. Soft Suede was used to stamp the pine cones. I found that if the pine cone image does not quite land on the branch, you can extend the pine cone stem with one of the brown Blendabilities. Then a used and ironed dryer sheet is sprayed with a craft glue, Working quickly, the sheet is pressed sticky side down over your stamped image. All the wrinkles are worked out and glitter is sprinkled heavily over the dryer sheet. I like to press the glitter into the sheet. It takes about 1 hour for the glitter to dry. Then you simply trim the extra dryer sheet off and adhere your layer to the Early Espresso cs. I added two red ribbon trims to the card front before adhering the front to the Soft Suede card. The end result is a beautiful card that is worth the glitter you will wear home! This is our fourth and final card for our November Stamp Camp. Just as a reminder, the dates are Thursday, Friday and Saturday – November 6th, 7th, and 8th. Times are 2 – 9 PM on Thursday and Friday, and 9 AM – 4 PM on Saturday. Stamp-A-Stack will be on Thursday, Friday and Saturday – November 13th, 14th, and 15th. I have amended the times to 12 N – 9 PM on Thursday and Friday, and 8 AM to 5 PM on Saturday. If you wish, I am willing to do some of the normal card prep for you – embossing folders, die cutting, etc. This will save you some time. As you craft your cards, you will do each step 3 or 4 times which does speed up your process. We will discuss this more on the upcoming Stamp-A-Stack blogs and at November Stamp Camp. If you know you are coming and can let me know which day, it is helpful, but not required. Give me a call, or send an E-mail if you have any questions or concerns. I always think of little children at Christmas time. We celebrate the birth of Jesus and see tots and toddlers become so excited. with this birthday celebration. “Bearing Gifts” portrays my thoughts of children on their way to visit Baby Jesus with their gifts for him. Perhaps we should add a lone gold star leading the way. This cheerful card is done in Real Red and Early Espresso with the single image stamped in Black Memento on a sponged Whisper White Top Note. Difficult to see is the light blue chalk applied lightly around the bear, and a bit of tan chalk applied to the bear’s tummy. The image is layered on Nordic Noel DSP and Early Espresso. The toddlers have been colored with Blendabilities and Frosted Sequins added to the wintry scene. This is the third of four cards for our November Stamp Camp to be held on November 6th, 7th, and 8th. The cost is $12 and will include all tools and supplies. We will have fresh fruit out and of course beverages are ALWAYS available. I hope you can come. Stamp-A-Stack is quickly arriving on November 13th, 14th, and 15th. Samples will be posted on the blog after I finish posting our stamp camp samples. I wish there were many more hours per day than 24! Somehow I can’t seem to get everything done!!!!! The final November Stamp Camp blog post will be of the “Ornament Pine” Stamp Set which we will be doing as a dryer sheet card. If I am unable to post this yet today, I will send it out tomorrow as early as possible. Cardinals are one of nature’s gifts both for the holidays and all year around. The cardinal pictured on this card comes from the Beauty of the Season Stamp Set. The branch, berries, and cardinal are on one stamp which simplifies the stamping process. We used a Crumb Cake and Cherry Cobbler color scheme. Yum – the words crumb cake and cherry cobbler in one sentence surely make me hungry – especially since I haven’t had any cake in over a year!!! The oval on the cherry cs was die cut with the ovals framelits. The layer was then run thru the Big Shot with the new Filigree Frame Textured Impressions Embossing Folder. This is a beautiful, curvy embossing folder. The cardinal/branch image was stamped in Memento black ink on Very Vanilla cs that had previously been misted with my “home brew” glittery spray. The branch image was colored with Crumb Cake and Old Olive Blendabilities. Cherry Cobbler Blendabilities were used to tint the cardinal, berries and 9 rhinestones. After the card was assembled, the rhinestones and an off-white bow were added. Two wonderful messages are available with this set that can be used inside the card and/or on the envelope. This is the second of four cards we will be making at the November Stamp Camp. The next post showing “Bearing Gifts” will be out shortly. I am really running behind this month. However, I will be ready for you crafters on November 6th, 7th, and 8th at our November Stamp Camp. month, is still available. Cost is $15.95. This is a beautiful set and would look wonderful stamped on vellum and colored with Blendabilities on the back side of the Vellum. I expect my set to arrive this week and will have it out for you to view at stamp camp. I will also have the Stamp-A-Stack samples out for you to view as well as on upcoming blogs. You can choose to do 3 or 4 each of the 5 stamp set samples. Cost will be $30 for 15 cards (you choose to make 3 each) and $38 for 20 cards (you choose to make 4 each). This cost includes everything except snail adhesive. If you choose to have snail adhesive included with the set, the cost is an extra $4 which would then be $34/$42. I tried to keep the cards less costly, but with layering and embellishments, the cost adds up. Snail adhesive will be available for purchase at the normal $2/roll. I make nothing selling the snail at this price – it is my cost. I will have a sheet available for sign-ups, or you can notify me by E-mail if you will be attending. Check back shortly for the next Blog – “Bearing Gifts.” Let me know if you have any questions or concerns. Halloween has passed and the fall time change has taken place. My Grandkids were over today jumping in leaves that my sweet husband had raked into piles. Such fun! I remember jumping into piles of leaves when I was a child in California. I’m afraid if I tried to do that today, I would break another ankle or not be able to get out of the leaves! Fall leaves remind me of Thanksgiving which is fast approaching. Our Thanksgiving card for November Stamp Camp comes from the “For All Things” stamp set. Our colorful Thanksgiving card has a color scheme of Cajun Craze, Crushed Curry, Mossy Meadow, Soft Suede and Whisper White. We stamped and die cut the leaves with the Fun Fall Framelits Dies. A wooden chestnut was pressed into the Soft Suede ink pad and presto – a brown chestnut appeared! Twine was gathered into loops and adds a light touch. 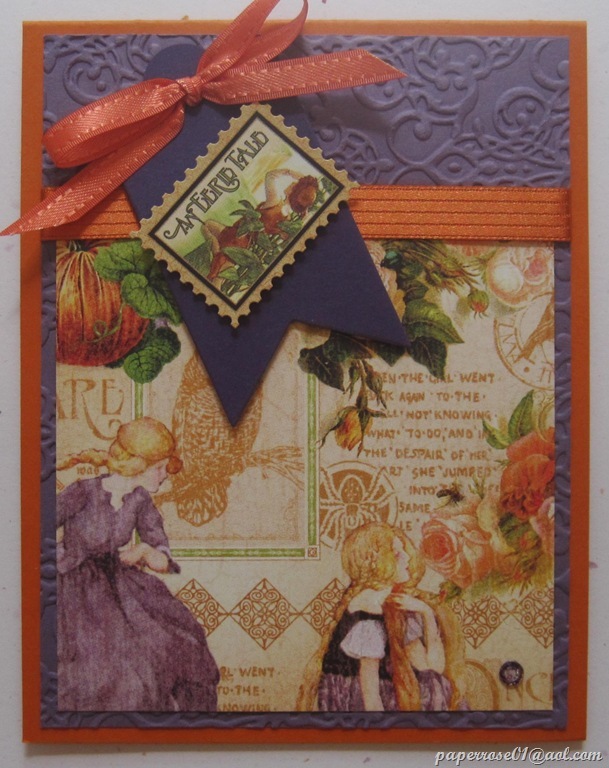 A small strip of Color Me Autumn DSP extends from the inside of the card carrying thru the Cajun Craze hue. This is a card you will be proud to send to a best friend or relative. Inside the card, Color Me Autumn Designer Washi Tape has been adhered to the top and bottom of the white card stock. 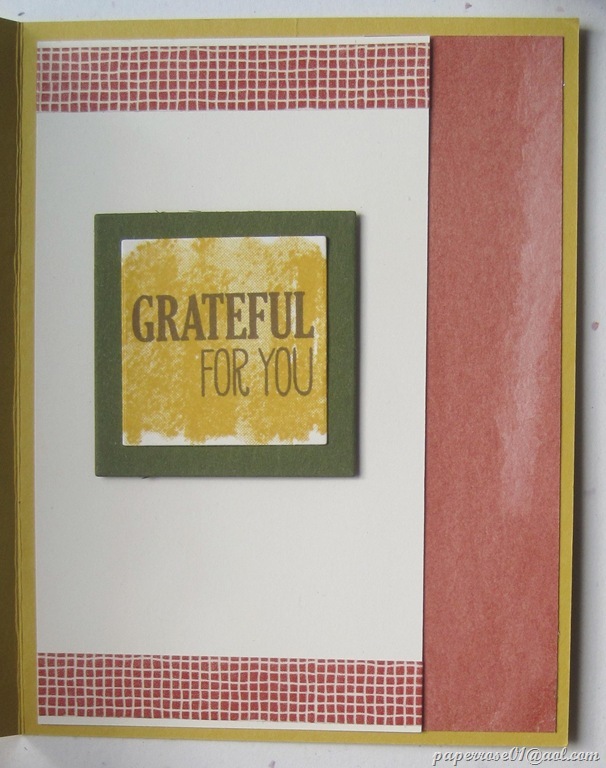 The message “Grateful For You” is stamped and layered to coordinate with the message on the card front. 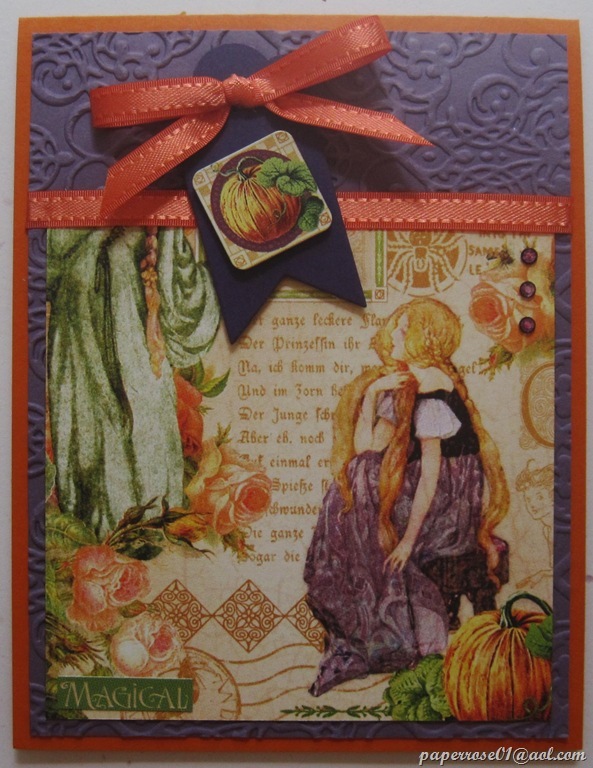 We will be lining the envelopes for this card with the Color Me Autumn DSP. A classy touch to a classy card! 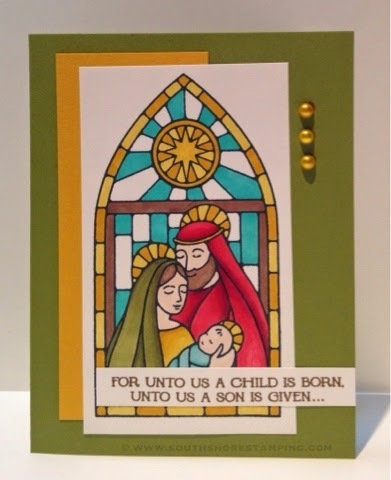 We will also be creating 3 Christmas cards at our November Stamp Camp. I apologize for not posting the samples sooner. I have been busy busy busy preparing for our Przybylski Halloween Open House and working on the samples for our Stamp-A-Stack so they can also be posted and viewed at the November Stamp Camp. As a reminder, the November Stamp Camp is Thursday, Friday, Saturday – November 6th, 7th, and 8th. Times on Thursday and Friday are from 2 – 9 PM; and 9 AM – 4 PM on Saturday. Cost is $12.00 and includes all supplies as well as drinks and fresh fruit. Stamp-A-Stack will be on Thursday, Friday, and Saturday – November 13th, 14th, and 15th. The times will be the same as normal Stamp Camp and I will let you know if we decide to start earlier. You are welcome to come 1, 2, or all 3 days and spread out your crafting. We have 5 stamp sets and you can choose to make 3 or 4 of the 5. For those of us who are math challenged – that means you can make 15 or 20 cards. More to come. 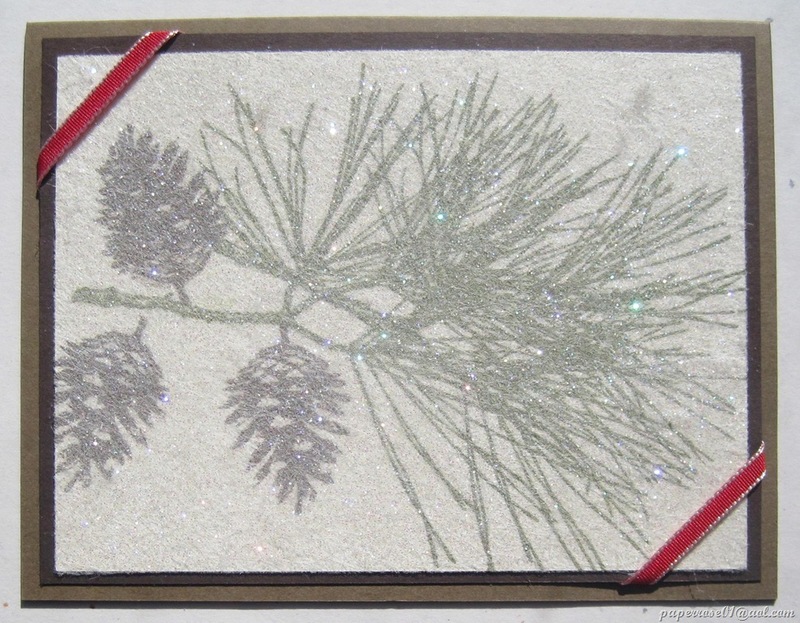 I hope you can come to our November Stamp Camp as we will be using the Ornamental Pine stamp set to create a card with an overlay of a dryer sheet and glitter. You will go home sparkling! 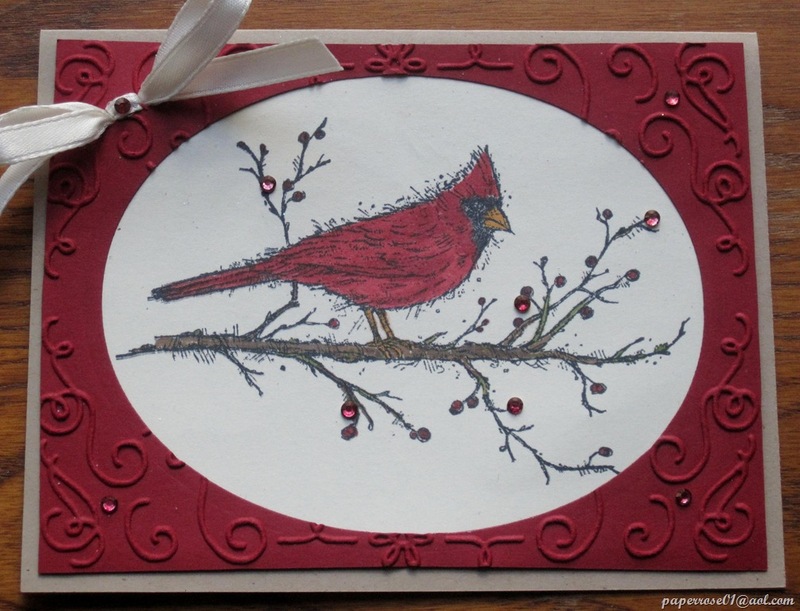 We will also be making a card with the Cardinal from Beauty of the Season and a cute card with the Bearing Gifts stamp set. This is a fun card with a Perfect Plum, Tangelo Twist and Very Vanilla color scheme. The Lacy Brocade Embossing Folder adds a touch of grandeur. The Tangelo Twist ribbon is the perfect shade for this DSP. I must admit that when I made the samples, I discovered I did not have the Tangelo Twist ribbon, but it has since arrived and will be on the table to use for this card. Note the sticker that has been popped up askew on an Elegant Eggplant banner. The banner framelits make it so easy to create any size banner. I used the Scallop Tag Topper Punch to add a curvy top to the banner. Although my card stock was less than the 2” the Tag Topper is made for, I simply centered the banner and punched. For a bit of bling, I tinted a large rhinestone and added it to the lower right hand corner. Each card will be different and you can look thru the pre-cut DSP to determine which view you wish to use. On this card, I used a pumpkin sticker (still didn’t have the correct ribbon shade) and a smaller banner. I added 3 purple rhinestones and a “magical” sticker in the lower left corner. There are many different stickers to choose from and I am wondering who will want to embellish with the spiders! The inside of your card can be nice – or not so nice. I used the Frightful Wreath stamp set ($14.95) that I had purchased to embellish my Frightful Wreath Simply Created Kit which hangs just inside the front door. Did you know that you can curve the photopolymer stamps? 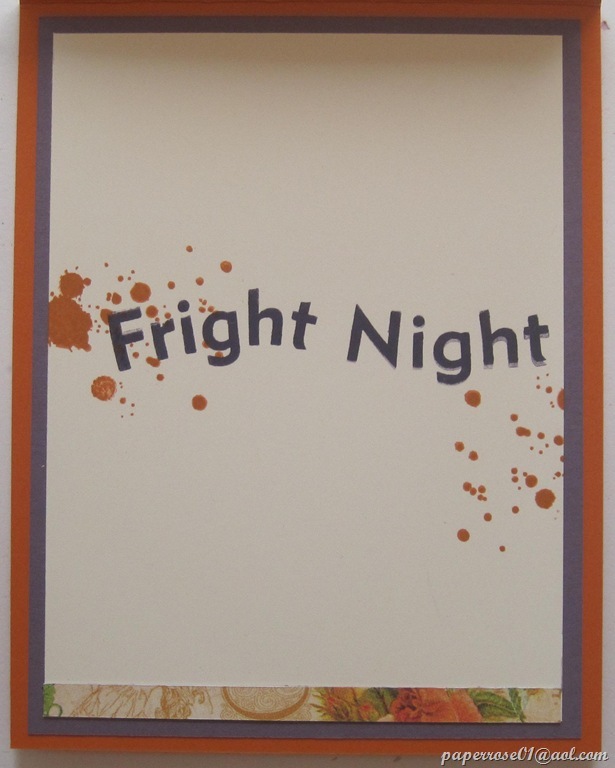 The “Fright Night” I used for the inside of this card is actually a straight stamp, but I curved it to fit better on my card stock. A small piece of DSP was adhered to the bottom of my message layer to carry thru the theme. This is the last of our projects for October Stamp Camp. Cost is $12 for coming to Stamp Camp or for the kit to complete at home. Dates/times are October 2 (2 – 9 PM), October 3 (2 – 9 PM) and October 4 (9 AM – 4 PM). It is helpful if you can let me know which day you might be attending. The special Iris Folding class is $9; dates/times are Friday October 17th from 3 – 5 PM and 7 – 9 PM; Saturday October 18th from 10 AM – 12 N and 1 – 3 PM. November Stamp Camp will be held on November 6, 7, 8. The special Holiday Stamp-A-Stack class with 15 or 20 cards will be held on Thursday November 13th and Friday November 14th from 2 – 9 PM and Saturday November 15th from 9 AM to 4 PM. December Stamp Camp will be on December 4, 5, 6. We will be making a holiday pop-up box and more at this end of year stamp camp. Debbi visited last week and designed our Festival of Trees card. This is a nice set ($15.95) that comes with 5 photopolymer tree stamps, tree trimmings, a holiday message, a pot for the tree, a cardinal and a star. We purchased the bundle which includes the matching tree punch ($27.95). 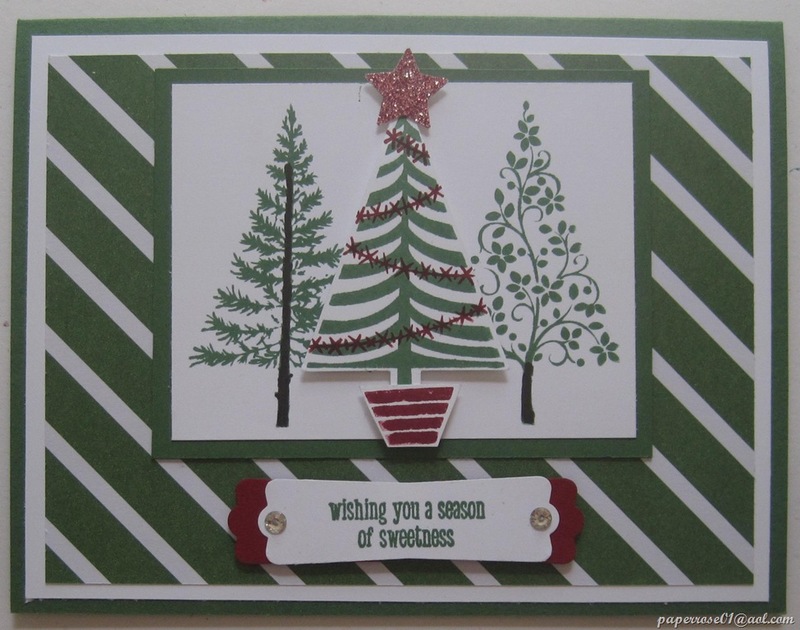 The color scheme Deb chose for this holiday card is Garden Green, Cherry Cobbler, and Whisper White. 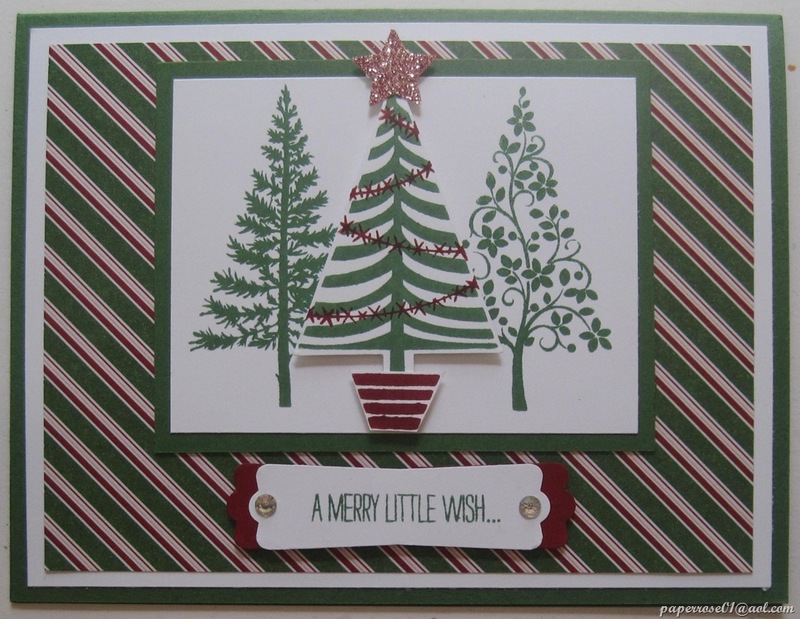 The background DSP comes from the Trim the Tree Designer Series Paper Stack ($6.95). We chose two designs – the one shown here, and the one below. However, you can choose any of the papers, and I will be happy to trim to the needed size. This view shows the second background paper we chose for our Festival of Trees samples. This DSP is very similar to the one above but includes a Cherry Cobbler stripe. Deb embellished the middle tree, punched it out, popped it up, and placed it in a cobbler pot. Finally, she tinted glimmer paper with a Cherry Cobbler marker and punched out a star for the tree top. A simple message was stamped in Garden Green, punched, shadowed with Cherry Cobbler and embellished with 2 rhinestones. Isn’t this a happy card full of holiday happiness? This is the 3rd card we will be making at our October Stamp Camp . As a reminder, this stamp camp will be held on October 2 (2 – 9 PM), October 3 (2 – 9 PM) and October 4 (9 AM – 4 PM). Other times can be arranged if this does not work for you. We will be creating 4 holiday cards for a cost of $12.00 which includes everything you will need to make the 4 cards. If you prefer a kit, please let me know as soon as you can and allow 2 days for kit preparation. Cost for the kit is also $12.00. Rumor has it there will be a small surprise for those who attend the October Stamp Camp. Wonder if it will be a spider or rat. I hear Norb has decorated the house in full Halloween garb!